Trans Adriatic Pipeline AG (TAP) announced that the appointment of Luca Schieppati as Managing Director and Walter Peeraer as President, both starting on 27 June 2017. Luca Schieppati will replace the current Managing Director Ian Bradshaw. 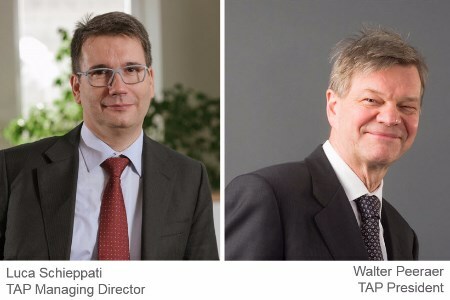 "TAP AG recruits new management team for TAP pipeline project"
Schieppati joins TAP from Snam, Europe’s largest natural gas utility, where he has worked since 1991. His most recent position was chief industrial assets officer of Snam as well as managing director at Snam Rete Gas S.p.A, the Group’s subsidiary managing 32 500 km natural gas pipeline network in Italy. Schieppati brings 26 years of experience in the development and management of pipelines, plant construction, and the operation and maintenance of gas transmission and distribution companies in Italy and Europe. Peeraer joins TAP as the former Managing Director and Board Member of Fluxys S.A, the Belgian-based European gas transmission assets management company. Within Fluxys, Peeraer also held various senior positions including Chief Executive Officer of Fluxys Belgium. Having left Fluxys in 2016, Peeraer brings more than 30 years of experience in the European utilities and gas sector and has extensive knowledge of European gas markets, regulations and infrastructure. He is also a former TAP Board Member.